While the world’s attention was fixed on the inauguration of President Donald J. Trump in the United States, another significant political transition was playing out across the Atlantic in Africa. After a few tense weeks, a peaceful and bloodless transfer of power has taken place in the West African nation of Gambia. Gambia is the continent’s smallest country—population of about 1.9 million—and is surrounded by Senegal. On Jan. 21 the country’s former dictator, Yahya Jammeh, left the country in an unmarked plane. He went off into exile in Equatorial Guinea after ruling for 22 years. A number of his former associates joined him. The incoming president Adama Barrow on Jan. 28 promised an overhaul of the country's feared security forces. In his first news conference since taking office, Mr. Barrow told reporters he also plans to rename the National Intelligence Agency, which was tasked with interrogating and sometimes torturing detainees. "It's an institution that has to continue, but the name will change," he said. President Jammeh had initially refused to recognize his surprising loss in the national election on Dec. 1. 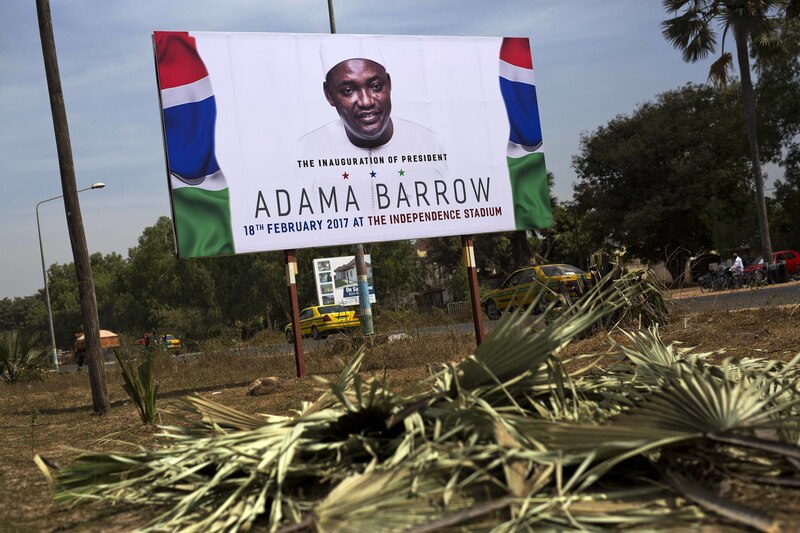 A real-estate agent turned politician, Mr. Barrow, was voted into power by Gambians. Mr. Jammeh had been in control of the former British colony since 1994 when he seized power in a bloodless coup. The prospect of civil war had been real as the now-former president dug his heels in and refused to hand over power. Several African leaders have refused to step down in the past; this would have been nothing new. Mr. Jammeh had agreed to step down if he were not re-elected. He had, in fact, conceded victory to Mr. Barrow after the results were announced before backtracking on his word and declaring a state of emergency. Tensions ran high and other countries in the region were preparing for action against him. Senegalese troops massed on the border. Nigeria, Ghana, Togo and Mali were also poised to intervene if necessary; their troops were on standby. Nigerian jets had already flown over Gambia’s capital, Banjul, as a “warning” to Mr. Jammeh that he should stick to his commitment to relinquish power. Mr. Jammeh’s former lawyer, Edward Gomez, (who was arguing the president’s case just a few days before Mr. Barrow’s inauguration) was himself forced to flee to Senegal. From Senegal, he too pleaded with Mr. Jammeh to step-down. “Please, let peace continue to reign in Gambia. My humble prayer to President Jammeh is to concede to defeat,” he told Senegal's 2S television channel. Mr. Jammeh had been trying to block Mr. Barrow’s inauguration as president through a court order. Mr. Barrow himself was forced to go to neighboring Senegal as tensions between him and Mr. Jammeh grew. The new president was sworn in at Gambia’s embassy in Dakar, the capital of neighbouring Senegal, the day before Mr. Jammeh left the country. Ordinary citizens celebrated in the streets when they heard that the new president had been sworn in. Everyone in fact should be cheered by this peaceful outcome. The regional body, the Economic Community for West African States (ECOWAS), was determined to uphold the election outcome and ensure the will of the people was respected. They were backed by the U.N. Security Council. By standing firm on its principles, this regional body is far ahead of many similar ones on the continent. The community had applied considerable pressure on Mr. Jammeh to step down. Contrast this to the case of Robert Mugabe in Zimbabwe. In 2008 he held on to power after rigging the national election. The Southern African Development Community did nothing to ensure that the real election result was upheld. It, in fact, allowed Mr. Mugabe to get away with it, agreeing to a deal that left him power—which he still clings to at the age of 92. Zimbabwe’s economy has collapsed, and many Zimbabweans have been forced to leave the country to survive. Neighboring countries have absorbed millions of Zimbabweans because of the dire situation. Yet these countries, and the region, still allow Mr. Mugabe’s reign to continue. ECOWAS publically condemned Mr. Jammeh, and representatives from its member states made several visits to Banjul to negotiate with him. The leaders warned that they would coordinate a regional military force to intervene, if necessary, and offered Mr. Jammeh no other option except exile. Attention now turns to the 51-year-old Mr. Barrow. After 22 years of Mr. Jemmah’s rule, Gambians have high hopes and high expectations, but the new president inherits a mess. The economy is struggling, and many Gambians are leaving the country seeking better lives in Europe. The country is also bitterly divided—Mr. Jemmah still has his supporters. Before departing, it is also alleged that the exiled leader looted the national coffers. Although the transfer of power was not straightforward, at least it did take place. For Gambians it represents a triumph of democracy; the people spoke and their voice was heard. This chain of events is significant for Gambian democracy and for the whole continent. The episode demonstrates that African solutions to African problems are possible. It may give other African regional bodies more confidence in their ability to deal with despots and serves as a warning to other corrupt leaders that the tide could turn against them. At the beginning of an era of unpredictable politics, Gambia could be a sign of what is to come in Africa. Leaders can no longer be sure of absolute power. Regional bodies and countries, it seems, no longer cower to dictators. This article also appeared in print, under the headline "After decades, a dictator is overturned in Gambia," in the February 20, 2017 issue. Russell Pollitt, S.J., is one of America's Johannesburg correspondents.